Despite my occasional whinging about the weather (sorry B!) I do love that we live somewhere that’s lucky enough to experience all four seasons. I love each for different reasons, but I particularly love the change between each season. The change from summer to autumn (“fall” for those of you in the States) has already started – the crispness of the evenings and early mornings, the colour of the leaves starting to turn. The slightly cooler temperatures are just the right balance where it’s not unbearably cold but still cool enough to warrant snuggling up on the couch with a cup of chai and a good movie on the weekends. One of my favorite places to see the change in season is a walking track near where I used to live. It’s right in the city, but the perfect balance of urban and country. The city behind you, the mountain (sometimes snow-capped) in front, and a rivulet winds along the track dotted with deciduous trees in their most beautiful time of year. We have been going for a walk along that track quite a bit lately, and the other week we took Maggie for a walk there one day after work. Maggie has always been headstrong with a sense of entitlement – I swear she think we are her humans, rather than her being our dog – and when she first came into our lives as a young puppy, she was utterly fearless as well. She would bound over to the other – much larger – dogs at the park despite her small size, until one day one of the larger dogs she was playing with accidentally trod on her and the incident scarred her for life. We refer to this dog as Maggie’s Arch Nemesis, and even though “the incident” occurred nearly 18 months ago, Maggie still holds a grudge. When her Arch Nemisis walks past our house these days, Maggie kicks off and barks ferociously at the poor dog trying to enjoy an afternoon walk with his human. On our walk the other night however, Maggie met another little dog similar to her age and size named Roger and played happily with no “incidents” for a good few minutes until Roger’s human threw an apple into the rivulet. Roger bounded in after it – apparently he has a fondness for both water and apples. Maggie – who is a bit precious and hates water, sulking when it rains, and only eats fruit if its hand-fed to her – looked on disappointed that her new friend had found something more interesting than her. Not being the centre of attention is definitely not something Maggie is used too. The other thing I love about autumn is the change in food. Our bodies are smart and if we learn to listen to them, they will crave the foods we need depending on the season or other factors such as if we’re run down or unwell and need foods to nourish us more than normal. The cooler temperatures over the weekend and the slightly hint of a cold had me yearning for a warm bowl of comforting soup, which is exactly what I have to share with you today. I first made this soup last winter and loved it, so I jotted it down to make again once the cooler weather set in. The soup is thick, rich and filling, but it’s the topping that really makes it so I definitely recommend you go the extra step and fry/grill the corn and make the Savoury Seed Granola for the topping. 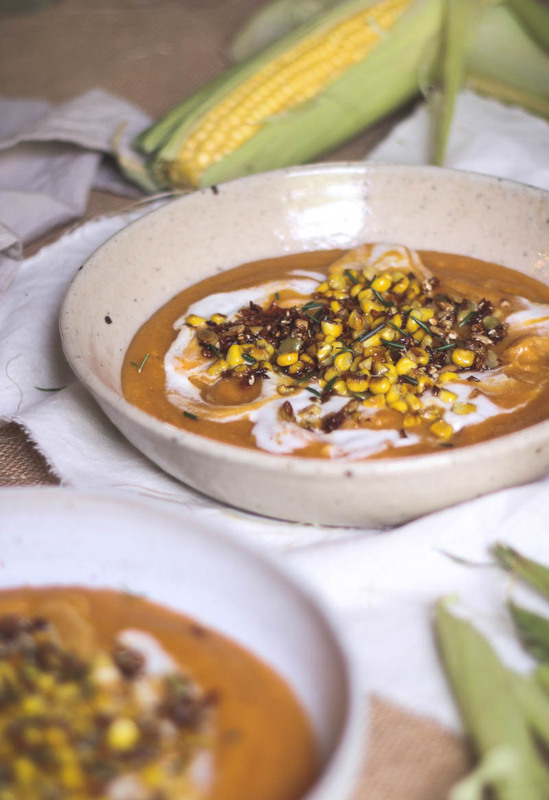 The sweetness and juiciness of the corn, the slightly salty and crispy granola, the rich velvety coconut cream and the fragrant rosemary really take this from being “just a soup” to being something a lot more special. Heat the olive oil in a large saucepan over medium heat. Add the onion and garlic and fry a few minutes until the onion starts to soften and become translucent and then add the rosemary and paprika. Stir well to coat, another minute or so. Add the lentils, sweet potato and carrot and stir to coat and then pour in the liquid, stirring to combine. Bring to a simmer and then cook for 15 minutes. Add half the corn and the tomatoes, and cook another 15 minutes. In the mean time, heat a skillet over high heat. Once hot, add the corn kernels, and cook, stirring occasionally until they start to brown on the outside. Make sure to watch the whole time to ensure they don't burn. 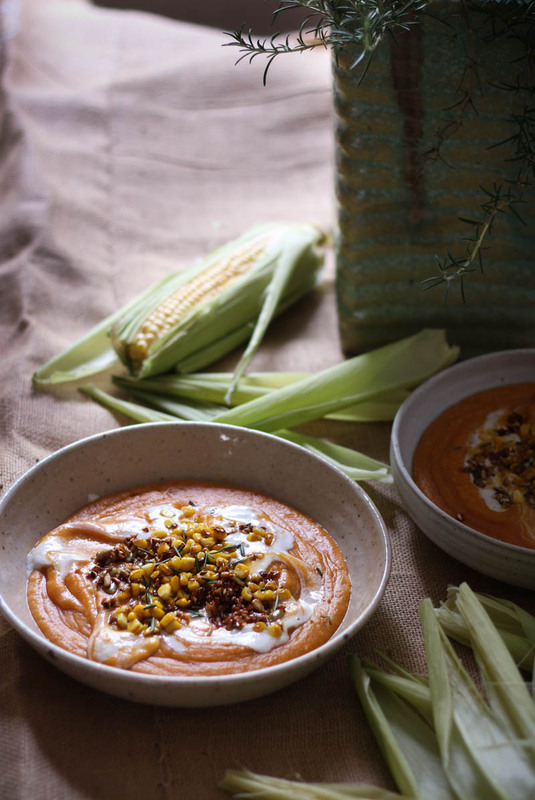 Using either a blender or hand blender, puree the soup, and then serve hot topped with the corn, coconut cream, fresh rosemary and the savoury granola. You could chargrill the corn on the cob instead here by cooking the shucked corn over a flame (ie on the BBQ grill) for 10 minutes or so, until the edges are charred with a wonderfully nutty aroma. The weather is beginning to cool here in Australia.. so this sweet potato & lentil soup is just ideal for me to make. I love how you have captured it especially. I know what you mean Dearna, I really enjoy having four seasons as well. 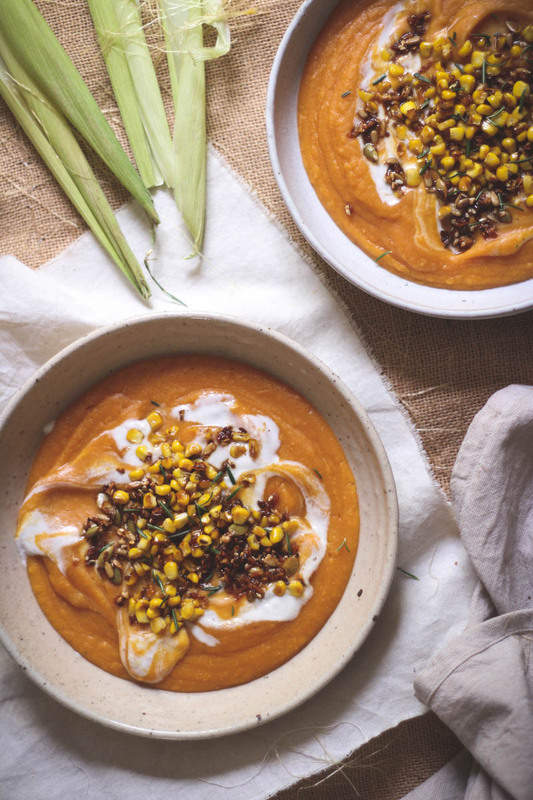 And I love that your soup merges the end of summer corn with Autumn comfort food. Delicious looking soup! I am so happy to live in a country with four seasons too. There is just nothing like the change from winter to spring or summer to autumn :) It is funny though – we are experiencing the exact opposite of what you are right now. Just this weekend spring finally wroe through. This soup looks wonderful. 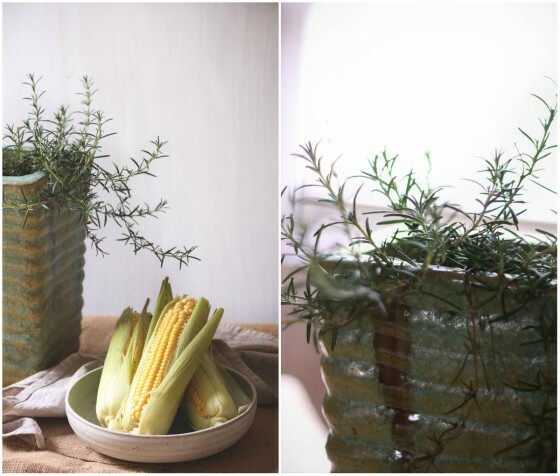 I don’t care if it is spring – I really want to try this!